Whenever I heard that call, shenanigans were afoot. His voice will forever haunt me. He was never Darion. He was never Pouncy. Not to his crew. No sir, to his WMU friends—comprised of native Flintstones, cats from Detroit and a lil’ dude from a small town called Ecorse—Darion Earnest Pouncy was simply “Pounce”. He was the glue that kept us together. Sometimes, attitudes would flare between boys, and Pounce would always be the voice of reason to bring us back in sync. He wasn’t boisterous; wasn’t loud or larger than life. He was cool. His demeanor was quiet confidence; never really one to take the spotlight, but always alongside his friends supporting the plan, whether it was taking the game to the court, or breaking into the dorm cafeteria after hours. Yeah, we did that. I’d never met anyone like him, and there will never be another to take his rightful place in my heart. Had I known the last time I saw him would in fact be the last time I would ever speak to him, I most likely would have said something a bit more profound. You can never go back. Today, my friend is gone. 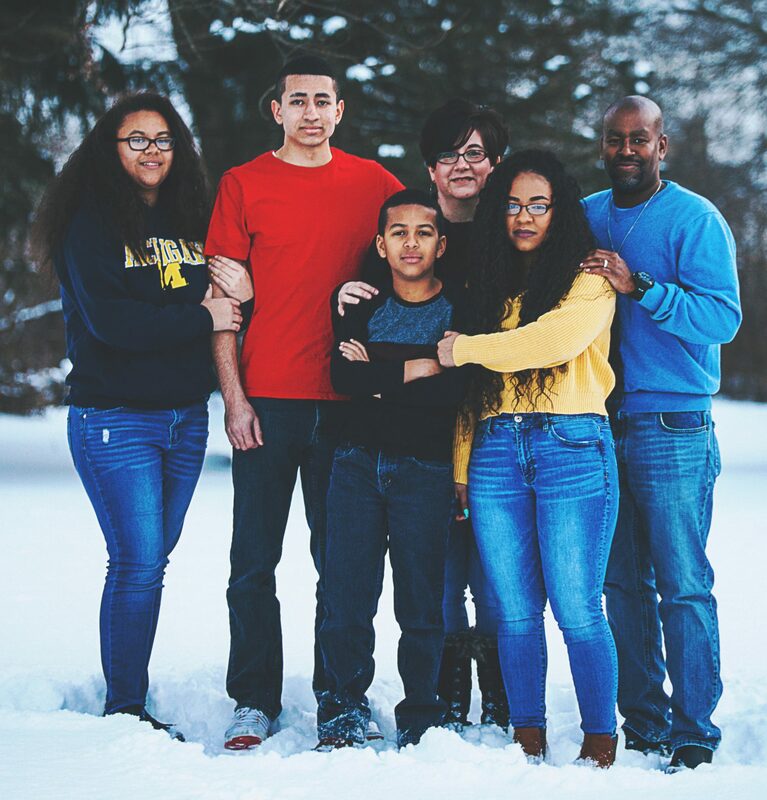 In the Fall of ’91, I moved away from my family, and into a first-floor dormitory room at Western Michigan University’s Garneau Hall—Valley Two; an uphill climb, both ways between the housing dorm and the main campus. The first night of my freshman year was the loneliest night of my young life. I remember feeling utterly alone and homesick. Tough guy that I am now, I think some tears were shed that night. Long before I ever found the Lord, I remember actually praying to Him to make the next day better. True to His character, the Lord came through. That next day, I was walking out of my dorm room, when I literally bumped into a young cat from Flint, Michigan who was passing through the hallway, on his way back to his own room…two doors down, on the left. His name was Darion Pouncy. That fateful encounter led to a friendship that would last until the end of his days. I remember a night in the late Fall season of that freshman year, when the crew assembled for a road trip to Detroit. Pounce’s beat-up hatchback was gassed and ready to make the two-and-a-half-hour trip from Kalamazoo to Detroit’s infamous dress-to-sweat “Club Inferno”. It was a different atmosphere in the 90s, and we were ready to cut loose and blow off steam on the dance-floor. A small portion of the crew—which included Alford “Gene” Harris; Bobby Johnson and Dante Carter—had packed into that little car and bounced; Tupac Shakur’s first album, “2Pacalypse Now” blaring through the screechy front and rear speakers of the rust-bucket, followed by Uncle Luke’s (that’s Luther Campbell to you squares) gig album of the year. That night, we partied until the club closed at 4AM, before making the long and tiresome ride back to Kalamazoo. While everyone slept during the return drive, I sat in the backseat as Pounce quietly navigated the darkness of westbound I-94. Occasionally, his head bobbed in time with the bassline of “Soulja’s Story” crackling the busted woofers of the little car’s taxed speakers. During that trip back to the dorm, I periodically checked on our driver, just to let him know someone was up awake with him. I remember glancing around the car, at my sleeping brothers and realizing these cats were my new family. “I did. I had a good time. What about you,” I asked. He answered in what would become trademark Pounce fashion. The trip took a little longer than expected, and I remember crawling into my dorm-room bed as the sky was changing from midnight black to pale blue, with the rising of the sun. It was the first time I’d ever stayed awake for over 24 hours. I crashed, exhausted yet grateful for my friends; my brothers; grateful for the chance encounter with Darion Pouncy. Somewhere along life’s path—after Western Michigan University—I took a turn that caused me to lose touch with my brothers. At the time, I figured leaving those relationships behind was probably for the best, because the change in trajectory had brought my wife into the picture. As a consequence, distance created a gap between me and everybody else who I’d once considered WMU family. Although social media provided a way for us all to reconnect, it just wasn’t the same. As we grew older, we lost touch—I lost touch. In spite of me, time and distance, some true friendships endure. In August of 2015, I was sent to Kalamazoo to complete a professional project for work. It had been years since I’d last seen or spoken directly to Pounce but like a true friend, when I called, he came. I opened the door of my hotel room and was greeted by that familiar voice. Suddenly, years melted into yesterday. The dap was strong and the love transcended time. In that moment, we were simply brothers catching up with one another after a short stint apart. I told Pounce about my life after Western Michigan University: kids, career, marriage, music, writing and God. I gave him a copy of my recently published book, and a CD of my music. He listened and brought me up to speed on his life, his lady and his dog. The reunion was short. He had things to do and I had a job to prepare for. We promised to catch up again, stepped outside of the hotel and snapped a selfie on his phone. Somewhere between the count down from “three” and “cheese” I flashed a goofy grin. I regret it now…because it was the last time I saw Pounce in the flesh. It was the last time I would hear his voice. I guess I figured there would be more time. It never came. Darion Earnest Pouncy was my first true friend, in the land of Kalamazoo. He didn’t know it then, but just knowing him changed my life for the better. When I danced in public, he cheered me on; when I ran guard on the court, he was by my side; when I was down, he had quiet and simple words of encouragement. Darion never knew I struggled with anxiety as a kid, right up into my first year at Western Michigan University. If he’d figured it out, he never made fun of me. He never laughed at me. He laughed with me. I regret the time I wasted out of touch with him; with Al; with Doug; with Dante; Jeff; Bobby; Redic, James “Book” and Jesse. I missed my friend. I will miss my friend. I wish I could have thanked him for bumping into me in the hallway. I pray he’s with Jesus; no more suffering; no troubles. I hope he’s straight. As always, I really appreciate your support and feedback. Paraclete’s Promise: The Fantastic Fantasies Of Timothy is the first book in the Paraclete’s Promise saga. While this book is now available at Amazon, Barnes & Noble and Apple, the second book is in progress. Enjoy. Tim was petrified; heart pounding, breathing shallow. All around him, bleeps and blips of the electronics on the console sounded off, running through routine pod operation. Static lit through his left ear again. Tim’s heart rate slowed. Shallow breaths became long tugs. His hands steadied. Tim rolled the captain’s chair within reach, and slowly sat down. The soft stretch of the supple leather and pneumatic hiss of the chair’s cylinder, under his weight, were welcomed sounds. He rolled the chair up to the control panel and pressed a sequence of buttons, activating Jonah’s personal tracking device. Just above the control panel, the on screen readout placed Jonah approximately 700 feet away from the pod, and he was moving fast. His heart rate was slightly elevated, but otherwise his vital signs read normal. Tim set his arms against the soft armrests, and reclined. He closed his eyes and inhaled deeply. Tim was so startled by the voice resonating in his head that he flipped the entire chair over backwards, crashing to the floor. But his trained muscles responded. With a quick roll, he was back up on his feet poised in a defensive stance, feverishly scanning the control room for another person, he hadn’t seen before. He pressed the com-link button as his eyes searched the room, top to bottom. His eyes fell on the floor monitors to his left. Lying there, almost invisible against the high definition darkness of the ocean, was his bible. In the drab light of the dimly lit control room, the stainless steel hard cover book was a welcomed sight. He picked it up, opened to the last page and read the custom inscription written across the back cover. ‘To my brave explorer: May the Lord’s word be a shining light when you are surrounded by the darkness of the cold world. Tim’s thumb absently parted the pages. Flipping through, he smiled at the scripture he found. Dad once said the Holy Spirit would always watch his back. First Samuel 14:7 was a comforting scripture to have handy, alone in the dark. The words washed over his heart. The remnant of his fear seemed to melt away. Scriptures flooded his mind, strengthening his spirit as he continued to recite miscellaneous lines from different books of the bible. Courage surged within his soul. He remembered bravery comes after great fear. An alarm beeped, letting him know Jonah was within 50 feet of the pod. Tim set the bible onto the console, and ran through the control room door toward the rear end of the pod. He jumped and dodged miscellaneous cargo and equipment still cluttering the hallway. As he reached the wet room, toward the pod’s rear end, he flipped open a wall panel and punched in a sequence of commands on the illuminated key pad. A loud flush reverberated through the pod. Beneath his feet, a small room filled with ocean salt water. Glancing between the keypad monitor and the sealed peep hole beside his left foot, Tim watched the water level swallow the entire wet room, before closing the water jet ports. The monitor read out blinked a confirmation message across the screen: WET ROOM FILLED. A large button on the keypad pulsed brilliant red. The monitor read out blinked, and Tim saw an overhead video feed of Jonah wading underneath the pod. A new message scrolled over the video feed: ESCAPE HATCH READY. Tim mashed his palm against the red button. The whole pod shook as the pneumatic cylinders of the hatch swung the three-piece sealed doors out toward the ocean floor. Tim watched Jonah swim up through the opening, then sit down on a stainless steel bench molded into the smooth circular walls of the wet room. Tim smiled as he recognized Jonah’s diving suit. It was amazing to see the body molded flat air tank, the high tech diving helmet with its polarized lens, the retractable flippers and personal water jets protruding from his belt. Tim tapped at the keypad. The doors of the escape hatch shushed closed, shifting the pod again. Behind the steel bulkhead to his left, he heard a whooshing sound as the machinery simultaneously pumped the water from the wet room and decompressed the chamber. He watched the monitor read out for a moment, making sure the sequence progressed slowly. As the water pumped out through the jet ports, recessed in the walls of the wet room, oxygen filled the damp room. Tim laughed, as a memory of Jonah screaming like a baby suddenly filled his mind. Tim looked down through the peep hole. Jonah flashed him two thumbs-up. A renewed wave of excitement came over Tim, as he walked up the narrow hallway toward his locker. He gently lifted the latch, slowly opened the vented door and marveled at the sight of his very own dive suit. Tim stroked a finger across the shoulder pad of the suit, hanging from a hefty steel hook. The material felt like soft leather, but was rigid like plastic. The whole one-piece suit seemed to be fashioned out of emerald scales. Each scale shimmered as his finger rubbed down its blunt edge, and pricked his finger, as he trailed back up against the scales. As he pulled the suit out, the hook retracted into the sidewall of the locker and a small compartment opened. A stainless steel shelf slid out of the open hole, with a dive helmet resting atop it. Tim draped the suit over his shoulder and watched the helmet slowly spin on top of the shelf. Two bug-eye shaped polarized lens, two tiny holes on the nose bridge, and a glowing open slit across the mouth made the helmet look like an alien head, from a comic book. The ears were shaped as small bubbles; speakers for the radio. Across the top of the helmet, he saw a leather fin stretching from the crown to the back of the helmet. Retracted now, it looked like a flat green ponytail. But, Tim knew that fin opened up in the water, to help maneuver his suit while swimming. He lifted the light weight helmet from its spinning stalk, and the shelf retracted into the sidewall of the locker. As the compartment closed, another compartment opened on the opposite sidewall, revealing an air tank shaped like a flattened book bag. Tim saw a green light pulsing on the yellow metallic surface of the tank. “Fully charged and ready for use,” he said. He set the helmet on the floor beside him, and removed the tank from its magnetized charging hub, with his free hand. The compartment closed, and a computer voice chimed. The locker closed automatically. As the latch clicked shut, a small stainless steel bench slid out from the wall behind Tim. He sat down and climbed into the suit, feet first. The inside was lined with a warm, soft material that felt like silky fur against his body. As he pulled the zipper up to his chin, he gasped as the suit compressed against his body, to form a tight yet comfortable fit. Tim lifted the air tank from the bench and slid his left arm through the shoulder strap. The tank seemed to move with a mind of its own, centering itself across his back with an electronic hum. The right shoulder strap automatically flipped over his right collar bone, across his chest, and magnetically connected to the left shoulder strap. A retractable belt cinched around his waist, from one side of the tank, to the other. As soon as the belt pulled tight, Tim saw a series of tiny lights strobe across his waist. A computer voice chimed from the belt. Everything fit perfectly and comfortably, as if the suit had been specially designed for him. He looked at his gloved hands and noticed the rubber webbing between the fingers. He watched the light-show reflecting from his utility belt. He was so enthralled with the technology of the suit, that he didn’t notice Jonah standing directly in front of him. Tim looked up. His mouth fell agape and his knees suddenly unhinged. He dropped to the floor, never releasing his gaze on Jonah. He could have been staring into a mirror at the moment. Tim mumbled as he stared into the hazel eyes of his twin. The wisp of freckles across the bridge of his nose; same bushy black eyebrows; same dimpled cheeks; same haircut; Jonah was the perfect clone. His mind struggled to register what his eyes were seeing. Tim shut his eyes and shook his head, silently praying that God would make sense of this whole experience. When he opened them, Jonah stood above him; a gloved hand reaching to pull him up off the floor. Tim slowly reached for his hand. Jonah yanked him from the floor, to his feet and clapped him on the shoulder. Jonah reached for a thigh pocket weaved into the left leg of his suit. As soon as the snap was undone, a yellow glow illuminated the hallway. Jonah reached into the pocket and palmed something that he’d found on his excursion outside of the pod. The glow seemed to radiate from both ends of his closed fist as he raised his arm over his head triumphantly. He tapped a button on his diving belt and the pod’s ceiling lights switched off. “Wow. Jonah, what is it?” Tim raised a hand to shield his eyes from the light. Tim shielded his eyes with both hands now as he tried to get a closer look at the object. Tim moved closer, still cupping both hands over his brow. At the same time, Jonah opened his hand and swung his arm down to waist level. The closer he moved toward Jonah’s hand, the object began to take shape, no longer shrouded by intense light. Tim shoved the peanut into a small pocket on the arm of his suit. He scooped up the dive helmet from the floor, and quickly followed Jonah to the wet room. Somewhere below them, a lost treasure awaited.